It's such a soft leather it feels like butter. The only thing I didn't like was that it didn't have a good, after the representation told me it did. It's still a wonderful jacket if u don't want a hood. Down to its finest detail, the Vivian Lambskin Leather jacket makes you yearn for cool weather. Elegant yet versatile, the smooth and supple Lambskin leather jacket dresses you right for work, an evening movie, or a weekend getaway. Best price for a great jacket! The leather is soooo soft and the jacket is so warm. The detailing is exquisite. I am 5 foot 9 & a half and I wear a size 14. I thought I ordered the size XL but instead I got a two XL. I thought uh oh at first, but then I tried it on and it fits beautifully, you want it to be a bit loose: the sleeves are plenty long and warm especially with the knitted wrist and thumb hole. For $$$ this jacket is a steal buy it if you can! This is a very nice soft leather jacket but I am too short for it to be attractive on me. The quality and texture is excellent. Beautiful coat. I did not fit. Overstock facilitated in store credit and the next size is on it's way.. Beautiful soft leather. Nicely detailed. Good weight. Love the color. I can't wait for the new size to arrive!! 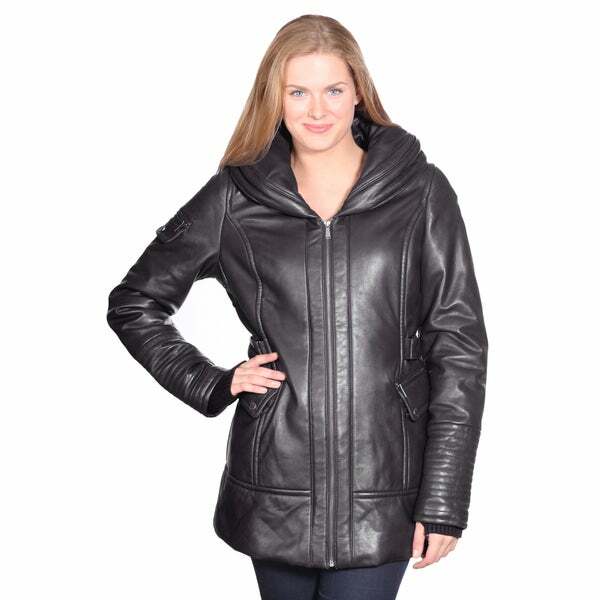 Coat is great, perfect weight for chilly weather, soft like butter, overall good quality leather. The two stars are for the sizing which is totally off. I ordered two times—&gt; a 3x and it’s still too small!!! Overstock...Redo sizing so customers aren’t wasting their time with returns. I should’ve listened to previous reviewers and saved myself the aggravation. So soft. Double thumbs up. Beautiful coat. Runs small. I'm 5'3, 105lbs. The medium fits great. Any smaller and it would be too tight. Only downfall is that there's no hood. I'm going to have hooks put on it so it closes by my neck. Great purchase. I bought three leather coats from this company and they are all gorgeous. I had to return this on though because it ran small. The other two were perfect. This coat is gorgeous just buy a size up. Fits like a very soft glove. Details are amazing! Runs small, so buck it up a size, especially if you plan on wearing a thicker jersey or sweater. Looks like exactly what I want, and at a reasonable price. Looked like a good value and for an item I been looking for. "L & XL: What is the waist & hip measurements? What is the sleeve length from top of shoulder to bottom of wrist?" Hello midniteoh, For the Large; Waist: 43 Hip: 50 Sleeve Length: 22.75 For the X-Large; Waist: 46 Hip: 53 Sleeve Length: 23 Thank you for shopping with us! "Does this have a quilted lining or warmer lining? What are the bust measurements?" Hello jeannieann314, bust/chest measurements are as follows: small- 41 inches, medium- 43 inches, large 46 inches, extra large- 49 inches, 2XL- 52 inches, 3XL- 55 inches. This coat lining is 100% polyester and insulation is 100% polyester. I hope this helps. Please let us know if you have any additional questions. Thank you for shopping with us!